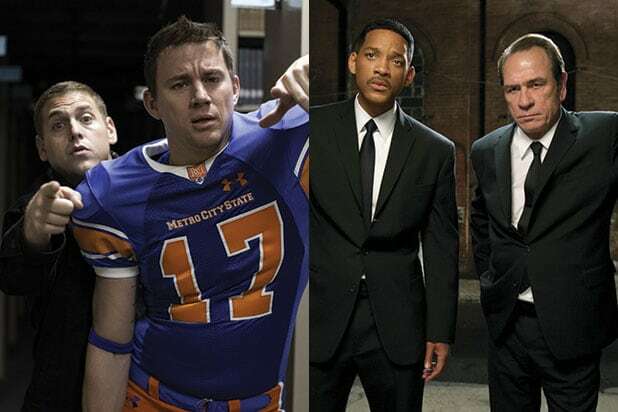 James Bobin, the “Flight of the Conchords” alumnus who directed “The Muppets” and “Alice Through the Looking Glass” for Disney, is in early talks to direct the “23 Jump Street”/”Men in Black” crossover movie for Sony Pictures, TheWrap has learned. Word of the project first leaked as a result of the Sony hack, though TheWrap advanced the story in April 2015, reporting that after sending up reboots and sequels, the “Jump Street” franchise would send-up the current Hollywood trend of Shared Movie Universes by having Jonah Hill and Channing Tatum enter the “Men in Black” universe and investigate aliens. Sony has been developing the crossover film at the same time as a female-driven spinoff written by “Broad City” writers Lucia Aniello and Paul Downs. Original “Jump Street” filmmakers Phil Lord and Chris Miller had hoped to direct the crossover movie, but they’re currently busy casting Disney’s young Han Solo movie, so it became necessary for Sony to seek out a new director. Lord and Miller will remain on board to produce alongside Neal Moritz. Will Smith, Tommy Lee Jones and Josh Brolin are not expected to return for the crossover movie, so Sony will have to cast new agents to fill their considerable black shoes — and fast, as production could start as soon as this summer. The “Jump Street” franchise has been a bright spot for Sony, which has seen solid returns from the series. The first “Jump Street” movie grossed just over $200 million worldwide but the sequel took the franchise to the next level, grossing $331 million worldwide — an exceptional haul for an R-rated action-comedy. “Men in Black 3” had the franchise’s highest global haul, with $624 million worldwide, though it also had the lowest domestic gross in the series, with only $179 million in the U.S. That indicates that while international interest has never been higher, American audiences are growing weary of “MIB.” “Jump Street,” on the other hand, has had higher domestic grosses than foreign grosses, so a combination of the two franchises may prove to be more beneficial to Sony at the worldwide box office. Represented by UTA, Bobin’s likely hiring was first reported by Variety.